Are you trying to reduce toxic air-borne chemicals in your home? You can buy an air purifier and you can grow plants indoors to naturally detox your home but if you’re still sleeping on a mattress containing dangerous toxins then you’re never going to be free from nasty chemicals lurking in your bedroom. Here, we look at the best natural mattress free from polyurethane foam with no chemical fire retardants and no synthetic fabrics. It really is easy to make this one important change in your home to improve your health and well-being. These days a smart home not only means one full of technology, but one that provides a healthy environment for its inhabitants. In your home you want clean air for yourself and your family. Everyone wants a naturally healthy home environment. And these days we can do more for our health than simply buy an air purifier. By choosing the right products in your home you can help eliminate nasty toxins. One of the most important items is your bed. Why? Because we spend so many hours on it. We spend one-third of our lives sleeping. That’s a lot of time to expose your body to a toxic mattress. Most mattresses use chemical fire retardants on the outside cover. They usually don’t even have to declare that the fire retardant has been used or what it contains. Fire retardants are used on mattresses for adults and kids. When you consider how close your head and body are to your mattress every night it really is important to get a natural mattress that is non-toxic and organic. What is the Best Natural Mattress? The best natural mattress is a mattress made from 100% natural latex. You should not be tempted to buy a cheaper mattress that is made from synthetic latex. There is a huge difference. Synthetic latex is made from synthetic chemicals that contain toxins. These mattresses will release toxins into your bedroom for years to come. Some mattresses claim to be “natural latex” but beware of this claim. If the mattress is not 100% natural latex then it is usually manufactured partly from natural latex combined with synthetic latex. This keeps the cost lower for the manufacturer. If your mattress contains fillers and synthetic latex you’re not getting any health benefits. Be sure to check the words used to describe a mattress and make sure it is 100% natural latex. This mattress from Sleep on Latex is 100% natural latex with an organic cotton cover and includes organic wool which acts as a natural fire retardant. If you’re looking for the best natural mattress, this one comes in 6 different sizes and 3 different firmness ratings. This mattress from Sleep on Latex is 100% natural latex and is made from a natural substance collected from rubber trees in Sri Lanka. The latex from the trees is a white substance collected from under the bark of the tree but it is NOT the sap of the tree. This white substance is collected in a coconut shell or another type of cup lower on the tree. A rubber tree can be tapped for its latex for about 30 years. The tree does not need to be logged or cut down in any way to be tapped for its latex. Rubber trees can be grown in plantations and they have less of a negative impact on the land than other crops. This natural latex mattress contains no poly foam, no synthetic latex foam, no blended latex foam. The cover is made from organic cotton and organic New Zealand wool. There are no fire retardant chemicals used in this mattress. The natural latex is collected and formed into the mattress in Sri Lanka. 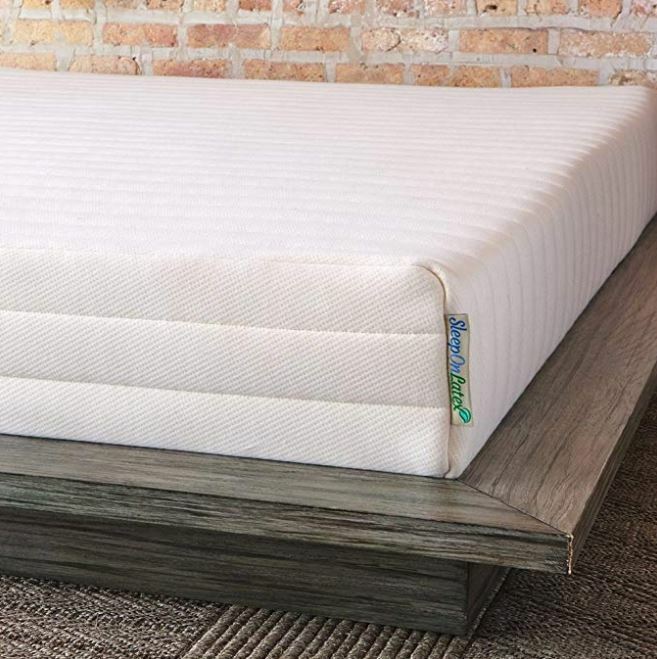 The mattress is designed, sewn, assembled and packaged in Chicago. The Sleep on Latex mattress is made with air pockets throughout the mattress. This helps with air circulation and keeps the mattress cooler. The mattress comes in three levels of comfort: firm, medium or soft. There are different sizes within each comfort level to fit the size of your bed. Most people do not have any problem with overheating from using this mattress from Sleep on Latex. In my own research a lot of people seem to find synthetic latex mattresses hot but they don’t find natural latex hot to sleep on. For this particular mattress from Sleep on Latex, it helps that the outer cover is made from natural organic cotton and wool because these are breathable fabrics which help air circulate. If you are wanting a cool sleep environment you should also consider buying pure and natural sheets and duvet covers. If you tend to sweat at night then 100% pure linen sheets could help (click on the image of the sheets below). Linen sheets are expensive but considering how many years of use you’ll get out of them it’s worth spending extra for comfort. Make sure they are 100% linen. You don’t want to buy a blend. This is because when you buy a mix of linen and another fiber you may be only getting a very small amount of linen in your sheets. Bamboo fabric sheets are another option for a cooler sleep. You’ll find bamboo sheets are usually less expensive than pure linen so this is a good option. Bamboo sheets are thermo-regulating so they’re cool when it’s hot and warm when it’s cold. The other choice is pure cotton sheets or duvet covers. Whether you buy Egyptian cotton sheets with a high thread count or another 100% cotton option, this natural fabric will help to keep you cool better than synthetic fabrics. The medium support Sleep on Latex mattress is the most popular level of firmness. However, some people find the medium too firm for comfort. You could get the soft mattress but if you want a firmer structure to your mattress then consider adding the softness on top. The medium mattress provides a really good level of firmness for sleeping but if you want softer comfort and you don’t want to get the soft mattress then there is another alternative. You can buy the medium mattress and also buy a Sleep on Latex 100% Natural Latex Topper. The 2-inch topper is ideal for placing on top of the latex mattress and gives you that extra comfort. Fire retardant chemicals like PDBE (polybrominted diphenel ethers) are chemical flame retardants and are now recognized as cancer producing substances. Mattresses, both the coil variety and the synthetic foam type, usually contain chemical fire retardants along with toxic formaldehydes, bromides and other synthetic substances. Fire retardant compounds have also been linked to reduced neuro-development in children when these chemicals were found to be higher in their bloodstreams. Studies have shown that 6 year olds who were exposed between the ages of 1 to 5 years, performed poorly in mental assessments along with poor physical motor-skills. You should buy a natural mattress with no chemical fire retardants. Whether you’re buying a new mattress for yourself or a child, everyone deserves to be given a chance to be healthier. You may improve your well-being or even avoid bad health in the future by avoiding exposure for so many hours to toxins. VOCs are a concern for many people. You should know that new foam mattresses are not the only culprit. Synthetic mattresses like memory foam and synthetic latex foam mattresses continue releasing toxic chemicals into your bedroom long after the initial VOCs have subsided from a new mattress. The reason for this is that as synthetic foam ages it breaks down and releases chemicals. This means you are exposed to nasty toxins for years after buying a new mattress. It never really ends. The only way to combat this is to find the best natural mattress. Of course, you should also consider an all-natural mattress topper to go with it. And don’t forget to change to natural fabric sheets and duvet covers too. This sounds like a big effort but you can do it quite easily by ordering everything online. Just make sure you get the right products because you don’t want to waste your money. Why Should I Buy a 100% Natural Latex Mattress? If you’re trying to find the best natural mattress you really should take a look at the Sleep on Latex 100% natural latex mattresses. They are high quality and will provide a comfortable and healthy sleep environment. ⇒ Have you tried a Glass Aromatherapy Diffuser in your home? See the best Glass Diffuser here. ⇒ Looking for Smart Light Bulbs? Take a look at the best Smart Bulbs here. ⇒ Have you tried a Himalayan Salt Lamp in your home? See more on Himalayan Salt Lamps here.